Will Governor Larry Hogan fully fund Maryland schools? Public schools are set to receive record funding in the projected 2016 state budget, with Gov. Hogan’s increasing funding by $109 million. However, Maryland school districts and their unions say they could will not be able to fill 3,283 jobs they had hoped to have if Hogan chooses not to fully fund the Geographic Cost of Education Index. It was projected to provide $68 million more. School advocates are calling these “positions at risk”, sometimes using the term “cuts in educator positions.” Some legislators used the term layoffs. Based on interviews with several districts, no teacher or support staff will actually lose their jobs due to lack of funding. Eight out of 13 counties affected by GCEI are receiving more funding than last year. But school systems will not be able to hire more staff as previously planned in order to cope with expected enrollment growth. “Local school districts would be forced to reduce both teacher and educational support staff positions, leading to larger class sizes and less individualized instruction,” said the Maryland State Education Association (MSEA) in a press release. County council members and commissioners are attempting to wrap up their budgets with its public school funding this month. With GCEI being half funded, school systems are cutting back on future positions and asking teacher aides to pick up the slack. “It’s extraordinarily uncommon to have a big question mark hanging over this much money, for the 13 jurisdictions impacted by the GCEI, this late in the game,” said John Woolums, director of governmental relations at Maryland Association of Boards of Education (MABE). GCEI funding dropped from a projected $136 million to $68 million. Hogan and his staff point out that the last two governors did not fully fund GCEI in their first year. Fiscal year 2016 would be the first year projected GCEI has not been fully-funded since 2010. “It is challenging, because every jurisdiction is impacted differently and they have different tools to respond,” Woolums said. Howard county plans to absorb the budget blow by repurposing 80 existing instructional support positions. “While you may have been a paraeducator for grade four, now you’re going to be a paraeducator from grades three, four and five, or something along those lines,” said Renee Foose, superintendent of Howard County Public Schools. Howard County’s GCEI dropped from the projected $5,474,000 to $2,737,192. But if you add the GCEI (funded at 50-percent), to direct state aid for primary and secondary education, Howard County will be receiving $6,932,000 more than FY15, for a total of $232 million. Foose said Howard County will have between 800 and 1,600 more students than this year. More of those students will be poverty-level, requiring more staff, and Foose fears not being able to support positions in the out-years. Montgomery County schools will get $17 million less in GCEI, and the Board of Education already scaled back its proposed budget by $12 million. Director of Public Information for Montgomery County Schools, Dana Tofig, said the County Interim-Superintendent, Larry Bowers, will also hold up 370 school-based positions allocated in next year’s budget to help cover the remaining gap. Montgomery County says it still faces a budget gap, despite receiving $30 million more (page A-77) in overall school aid than the previous year. Its total state school aid is $655 million. Tofig said the number of students qualifying for free and reduced priced meals, an indication of poverty, is growing “much faster” than enrollment. As they await a final decision from Gov. 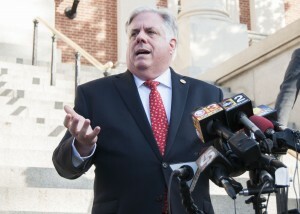 Hogan on funding, Howard and Montgomery County public school budget’s remain in flux. Projected public school budgets are usually approved by local jurisdictions in mid to late-May, with the fiscal year ending June 30th. Gov. Larry Hogan on final day of legislature. Hogan said if he will restore GCEI to it’s projected amount, and this is making counties nervous since he is not legally required to do so. The governor defended his 50 percent reduction at the 100 Days of Office press event, choosing to spend more on other educational outlets. “We are all 100 percent in agreement that the top priority for our state is education funding. We’ve agreed on $109 million increase over the last year and $290 million more for new school construction,” Hogan said. After campaigning to set Maryland on a more fiscally responsible course, funding pensions and reducing the structural deficit creates the opposing balance on Hogans’ scale. On Wednesday, he announced that he would use $68 million fenced off by legislature to maintain the 2% raises for state employees granted in January. State workers will get no merit or step increases in pay; many teachers will. Baltimore City is in the top three of GCEI funding cuts, losing $11 million of the $22 million the city schools were expecting. GCEI cutbacks paired with reduced tax base, compensatory and special education funding cutbacks has the city receiving $25 million less than FY15. Baltimore City’s Board of Education adopted their public school budget on Monday, with the assumption that GCEI will be fully funded. “If we don’t get that money back, then we have to make some choices,” said Ryan Hemminger, budget director of Baltimore City Public Schools. The Baltimore City public school budget has set aside approximately $10 million, which will not be distributed to schools unless the board receives full GCEI funding. The extra money was found through “surplus” positions that are not permanent. These positions, when funded at 100 percent, cost $15 million. Baltimore City school principals determine the amount of teachers needed, using distributed funds to hire extra hands. “If the GCEI money returns and we distribute that 10 million dollars, there is a likelihood that our principals will decide to add additional staff into their schools,” Hemminger said. According to MSEA, approximately 46% of Maryland public school funding come from local sources and 49 percent comes from the State. The federal government provides only 5 percent of public school funding.